#10: White Skunk Feminized from Sensi Seeds/White Label. A rather hardy plant that produces quite potent buds, White Label’s White Skunk produced consistent plants that stood up well to an insect problem we experienced during the grow. This is a great plant trait for beginning growers! #9: Barney’s Farm Auto Pineapple Express. Although the price for Barney’s Farm seeds hovers above our $10/seed “cheap seeds list” limit, we were surprised by the fine aroma and lovely body high we experienced while riding on the Express, and suggest you consider getting on board if an autofem is your destination. The aroma did remind us of pineapple, albeit more like Matricaria discoidea a.k.a. “pineappleweed” or “wild chamomile”. #8: Royal Bluematic from Royal Queen Seeds. They’ve recently bumped up their price a bit, but these seeds are the least expensive of the popular “Auto Blueberry” type strains on the market. Fruity, resinous aromas in the cured buds are a treat, and make for a smooth smoke to boot. #7: Afghan Kush from Sensi Seeds/White Label. Although not a feminized strain, this is a classic plant for breeding purposes, so having a male plant for some pollen is not such a bad thing. The buds are fat and resinous with a delightful hash-, or sandalwood-like aroma that will please any cannabis connoisseur. #6: Weed Seed Shop Auto Skunk. Although these plants did not produce buds in the quantity and with quite the potency of Weed Seed Shop’s famously inexpensive and tasty “Feminized Skunk”, the autoflowering characteristic, easy grow, and great price lands this strain in the middle of our list of favorites. #5: Special Kush 1 from Royal Queen Seeds. This one makes our list primarily because of the unbelievably low price. “Special Kush” is, however, also a fine producer, and not unlike White Label’s Afghan Kush, albeit a bit less potent. Overall, RQS provides great seeds, and we’d definitely suggest this strain for a first time, budget-conscious grower. #4: Easy Ryder from Attitude Seed Bank. Not the most spectacular bud on the planet, but an easy grow, and without a doubt much MUCH better than getting your grass on the black market. Price/performance is great and these are short-and-stealthy, sturdy plants that are very forgiving of beginner grow errors. #3: Northern Light Automatic from Royal Queen Seeds. With a killer price, reliable germination, and great genetics that produce bombastic buds, these seeds rank very high on our list. 9 Euros for 3 autofem seeds? Who can resist this? RQS shows up three times on our top 10 list – because they rock! #2: Brainstorm from Dutch Passion. This is a great cannabis strain for indoor grower on a budget but with high hopes of growing a powerful indica-dominant strain. These are feminized seeds of the highest caliber with low odor during the grow and impressive yields of strong indica buds that will lock you down to your couch and relieve what ails you. #1: Weed Seed Shop Feminized Skunk. You may have read our grow report here on the blog, and learned that we LOVE these seeds. 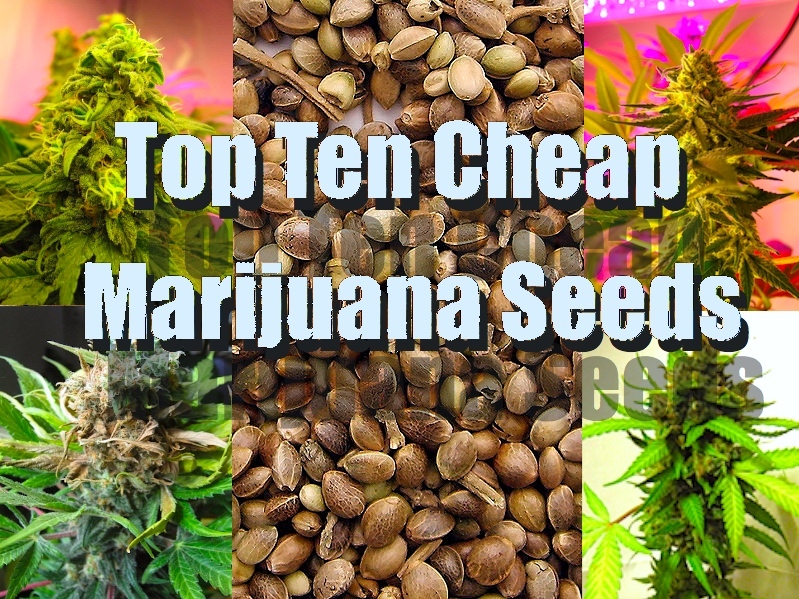 10 seeds for about 15 bucks makes them our price/performance winner, great for indoors, and an even better way to populate a big outdoor grow. We’ve encountered only great phenotypes over several grows. The buds cure to a delicious balance of orange/mint/ganja flavors (one pheno gave us a great lemon/black tea/diesel aroma) with a long lasting, well balanced body high, with just enough “head” to raise spirits without bringing on rushing thoughts or paranoia. Cheers to the Weed Seed Shop for bringing this one to the masses. Again, it’s worth noting that Royal Queen Seeds took 3 of the 10 in our review (we are not affiliated with RQS nor do we use sponsored links). They’ve got it goin’ on right now; great genetics, great prices, and great germination rates for their product. HOWEVER – no matter which seeds you choose, you need to care for your plants properly from germination to harvest, AND know how to harvest, dry, and cure your buds. Take it from the fearless leader of our blog, and order Glenn Panik’s monumental work for beginning growers, “How To Grow Cannabis At Home: A Guide To Indoor Medical Marijuana Growing” available on iTunes here, for the Amazon Kindle or via Smashwords here. Smashwords provides you with all the formats in one; Kindle, iBooks, PDF, etc. You can also order the ‘stealth title’ of our information-packed ebook for the Kindle here. We hope you’ve had a happy, healthy past holiday season, and wish you the best for 2012. Thanks for visiting the blog. Please browse our earlier posts, and be sure to check back soon for more home growing tips, tricks, and techniques. This is the great blog post and it will really help our business. By the way our business is same as yours. Find here Cannabis Seeds, Marijuana seeds and many more. Here are a few thoughts on what you can do, and what you can expect.